October 18, 2018 Ottawa, Ontario Canadian Gas Association – The Canadian Gas Association (CGA) has received broad support from stakeholders encouraging the Government of Canada to endorse CGA’s federal policy proposal for a Renewable Gas Innovation Program. The proposal seeks a Federal Budget 2019 allocation of $750 million to support renewable gas project deployment, to facilitate technology commercialization, and to enhance federal laboratory renewable gas R&D capacity. To date, more than 35 letters of support have been sent to the Honourable Amarjeet Sohi, Minister of Natural Resources Canada. 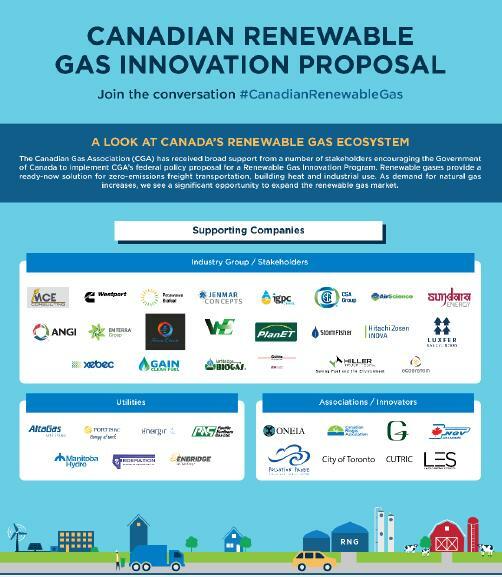 To advance the discussion further and to educate Canadians about the role of renewable gases, CGA has launched a social media campaign #CanadianRenewableGas via @GoSmartEnergy and LinkedIn. It includes factual information on renewable natural gas (RNG), hydrogen, and synthetic methane, and details on the role they can play in providing low emission energy for Canada. We encourage participation in the campaign #CanadianRenewableGas and offer more information on our website. Looking forward, natural gas has an important and growing role to play in Canada’s long-term energy future. The National Energy Board forecasts that by 2040 natural gas will be the largest source of energy in Canada at 40 per cent of energy demand. With this demand growth, we see a significant opportunity to expand the Canadian renewable gas market. 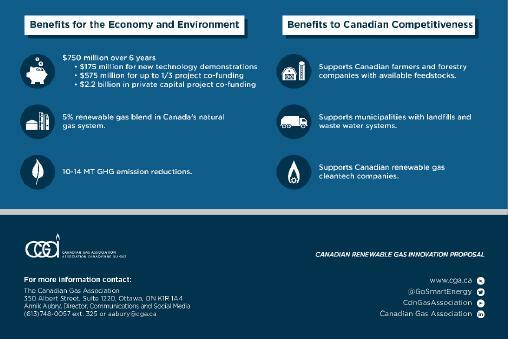 Canada’s extensive underground natural gas infrastructure and untapped renewable gas opportunity position us well to achieve CGA’s May 2016 aspirational goals of 5 and 10 per cent RNG content by 2025 and 2030 respectively. However, in order to ensure success, sustained policy recognition and program support is required. For Canada, renewable gases offer a ready-now solution for reducing emissions from freight transportation, building heat, and industrial energy needs. By substituting just 5 per cent of Canada’s gas supply with renewable gases, it would reduce GHG’s by 10 – 14 megatonnes. Kurt Sorschak, President & CEO, Xebec Adsorption, Inc.
homes, businesses, hospitals and schools.